Original Playfield Artwork For The Rare Williams "Still Crazy". With Hand Editing and Notations. This is the only piece of original artwork known to exists from a very rare Williams project called "Still Crazy". The Still Crazy game was a unique "vertical" pinball style game which the player used flippers to get as many balls up the playfield before the timer ran out. Williams only built 12 prototype games and never put it into production. This full scale artwork is two layers. The top layer is a clear mylar that is the black-line and the bottom layer is the color. The color is all hand drawn using a felt media. Please see photo's for details and condition. This has been stored in the archive files rolled up. No, we don't do ironing. This item includes a certificate of authenticity. "One of a kind" piece. Is one of the rare items which we are currently offering from the Bally archives which we obtained in 2009. Everyone is unique and original. Only a small amount of the archives are available as a large portion of the archives have recently been sent to the Strong Museum in Rochester, NY for permanent display and research. 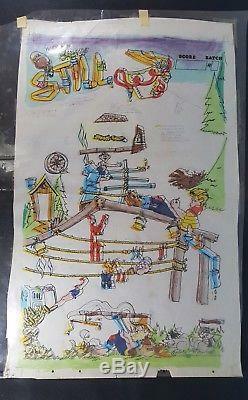 The item "Original Williams STILL CRAZY Playfield Artwork! One of a Kind Piece of History" is in sale since Wednesday, January 2, 2019. This item is in the category "Collectibles\Arcade, Jukeboxes & Pinball\Pinball\Merchandise & Memorabilia". The seller is "pinballace" and is located in McDonough, Georgia.